Many of you have heard of the Cloud and with our world becoming ever more online it seems logical to look at that as a viable platform, but is it all it’s cracked up to be? The cloud is a virtual environment, so all of your data, files and even applications can live online in a secure environment. Optionally you have your normal home or office environment whereby you store all of your files on your pc or a network hard drive such as a NAS. The Cloud is a great sounding place, giving you access to your information from anywhere in the world. The Cloud means you need a decent internet connection and any failure in that internet connection means you won’t be able to access those files. Downtime to your riding centre means bookings cannot be made and work falls behind. You’re reliant on the online Cloud system to manage your backups. You will pay for a decent, secure and reliant Cloud system per month. Files are kept on your own pcs in your home or office. The files are guaranteed to be available without needing internet connection. It is possible to gain access to your files whilst out of the office using remote access software. You can fully control your backup systems and data. A lot of I.T companies promote the Cloud as it is the big buzz thing for many, but it is not a fit all solution. 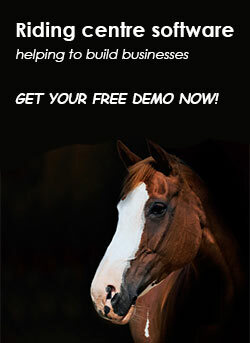 I know that many of the businesses in the equestrian world often have reduced technical skills, support and the right environment so a Cloud solution needs to be considered on an individual basis. My own rule of thumb for most small business is always, “Keep it Simple” – never over complicate the final solution. The problem some of you might have is an overzealous I.T company trying to convince you to go all out so definitely seek opinions and advice before taking the plunge. I hope this helps some of you that have been asking and discussing the Cloud.